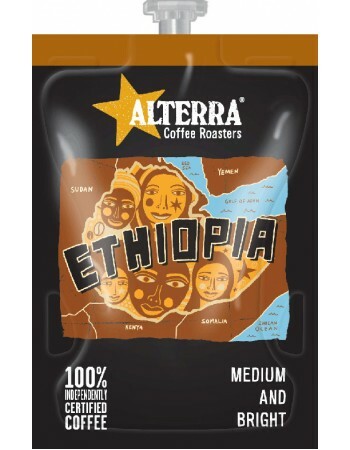 Indulge yourself with a perfect ALTERRA COFFEE ROASTERS, Flavia Ethiopia Coffee. From the Ethiopian highlands, to your cup, the 100% Yirgacheffe beans are medium roasted to give a distinctive bright, fruity flavour. Fast Drinks vending are your first choice for secure Internet ordering and FAST delivery of Flavia ALTERRA Ethiopia Coffee refills. We are a leading Flavia supplier based in the UK. Our prices are some of the most competitive on the web and we are proud of our outstanding on-going customer service and support.